Dammit. Last week in Minnesota, a man was charged with murder after allegedly opening fire at passing cars and killing a 9-year-old boy: Nhan Tran, Minn. man, charged in shooting attack that injured 2 women, killed 9-year-old boy. 34-year-old Nhan Tran was charged with killing fourth-grader Devin Aryal, who was riding by in a minivan and shot multiple times, including in the head. His mother was shot in the arm. Another woman was also injured. 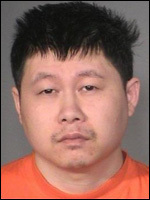 According to witnesses, Tran was just walking down the block in the St. Paul suburb of Oakdale, shooting at passing cars. According to the criminal complaint, Tran was carrying close to 200 rounds of ammunition and two large knives when he was arrested. What the hell was wrong with this guy? Tragic. Aryal said she was driving Monday evening when she saw a man on foot shooting at her minivan, according to the complaint said. She drove to the parking lot of a nearby Rainbow Foods when she realized was shot. She then noticed Devin was slumped over, and held him until an ambulance arrived. "He didn't deserve this. He was just a baby," she said Tuesday. Karen Knoblach, 68, was driving another vehicle with her three granddaughters when they saw a man shooting at them. Knoblach was shot in the leg and hand. She had to have part of a finger amputated but was in good condition at Regions Hospital on Wednesday. Two other vehicles were also damaged by gunfire. One woman said she saw a man shoot five times at one vehicle, then turn his gun on her. The woman ducked and kept driving as gunshots hit her windshield, according to the criminal complaint. Police found three bullet holes in her front windshield, and one bullet had hit the headrest of the front passenger seat, the complaint said. A man in another vehicle told police he saw a man in the street and realized he was being shot at when a bullet struck his windshield. The driver said he saw the gunman bend over as if he was reloading, so he quickly drove away, the complaint said. A judge ordered Tran to undergo a mental health examination. He is charged with a total of six counts, including second-degree intentional murder, second-degree murder during an assault, attempted murder and assault. More here: Oakdale: Boy killed, 2 injured in random shooting; suspect ID'd.